Popping back into the forum to say how cool this is! Topic: What song do you have on repeat right now? Re: What song do you have on repeat right now? Been a while since I've posted here. I've been listening to a lot of Beyoncé's Lemonade recently. My favourite song is "All Night", which I can't can't stop listening to it! Topic: SERIOUS: Your wildest nightmares might've been true about Trump. Re: SERIOUS: Your wildest nightmares might've been true about Trump. PlasticRam wrote: Theresa May hopefully is one of the good people. shocking news to wake up to in the morning! RIP David Bowie, a true great. Electronic music isn't much in vogue near here, but Floating Points is releasing an album called Elaenia which is shaping up to be fantastic. The first single (Silhouettes) is probably my track of the year. Topic: The update is here! Re: The update is here! I'm most happy about Kendrick's rise. Hopefully he'll also rise every update until he's finally in the top 50 AT as he deserves. Topic: Albums You've Listened to the Most Number of Times? Re: Albums You've Listened to the Most Number of Times? 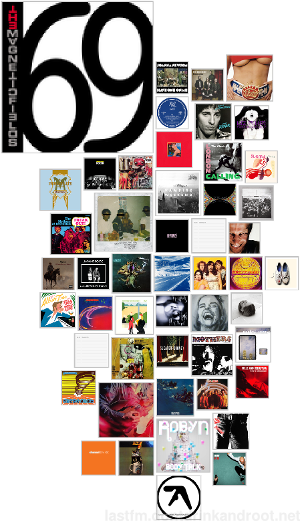 This is my album "cloud" thing from last.fm. 69 Love Songs really sticks out! Wow, thanks Jackson! With 7 #1 votes, Kanye blew the opposition away. Surprised to see the remaining top 3 include Arcade Fire and PJ Harvey. I didn't really think either of those would develop into stone cold classics of the decade (even though I quite like them both). I've not really followed music from this decade very much (except of course 2010...), but I'm quite impressed/surprised with how strong that first set is. Actress/Darkside/RTJ/Drake etc I would have assumed would do better than they did! Really really happy that Good Intentions Paving Company did well. Joanna Newsom is terribly hard to introduce to people, but with Good Intentions Paving Company, she finally did it. It's a great Joanna-pop song. Topic: Kendrick Lamar's "To Pimp a Butterfly"
Re: Kendrick Lamar's "To Pimp a Butterfly"
(My top two songs of the half decade are “Pray For Newtown” by Sun Kil Moon and “Birds of Paradise” by Chromatics — Au contraire - listened to Kill For Love last night and it was hauntingly beautiful. Birds of Paradise was one that stuck out for me, and will definitely feature somewhere in my list. HENRIK! On top of knowing most about what the critics think, it turns out he also knows most about what we think each other thinks. A cool calm and collected 212 points. Also, note the huge 120 point jump from Born To Run and IV. Three #1 votes and a whole host of top 10 positions hoist Who's Next up to 7th. It's the second album to receive more than one #1 vote, after Robert Wyatt's Rock Bottom.